David Sherfinski and Stephen Dinan at the Washington Times offer a piece on Secretary of Homeland Security John F. Kelly (seen in the above official photo) and his concern over transnational criminal organizations. 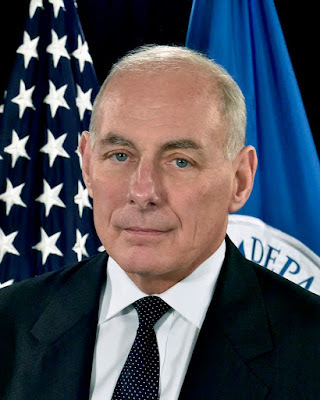 Smuggling cartels are now a major threat to the fabric of American society, Homeland Security Secretary John F. Kelly declared Tuesday, saying the international crime syndicates have shown an incredible ability to sneak drugs and people — and potentially terrorists and dirty bombs — into the U.S.
Mr. Kelly, a former Marine Corps general who is three months into his tenure as secretary, said among all the other dangers facing Americans, the threat from the cartels, known in the security world as “transnational criminal organizations” is what keeps him up at night. He said the Trump administration has already notched some victories over the criminal networks, including cutting the level of illegal immigration across the southwestern border by a staggering 70 percent. But he said the amount of drugs has increased and that the smuggling cartels share ties with the terrorist networks that the U.S. is fighting overseas.